Chocolate Pavlova with Avocado Chocolate Mousse. The fluffy sweet confection,Meringue is one those seemingly easy recipe with simple ingredients - Egg whites and Sugar.But not until the two are married with utmost care ,the result can be disastrous.To understand the chemistry behind the amazing dessert in short,breaking the egg protein until it can expand to about 8 times the original volume while whipping in the sugar to stabilize the multiplied volume.The glossy mixture when baked at moderate temperature results in an airy melt-in-your-mouth dessert. *Use clean, dry bowl,preferably a glass bowl, ceramic or copper.Even a minuscule amount of fat can ruin the meringue. *Separate the eggs when cold and then let the whites reach room temperature before beating them. *Besides the sugar,use either cream of tartar or white vinegar or lemon juice to stabilize the meringue. Add 1/8 teaspoon of one of these per egg white to the unbeaten eggs. *Only super fine sugar works ,any kind of sugar substitutes fail to hold the meringue. *The flavoring can affect the acidity of the meringue,be sure to use dry ground flavors- Cocoa,coffee,saffron,macha tea,dried shred coconut are some of the best. *Bake at low temperature,200-250F is ideal.If the temperature is too high, the the top browns before the water inside has time to evaporate. A lovable dessert - pavlova,is pure meringue confection.The daring challenge was to make it all chocolaty ,using cocoa for flavoring the meringue and topping with the rich mascarpone mousse.I was looking for a lighter pavlova,lower in calories.I could not possibly fiddle with the meringue ingredients,cause no sugar substitute works,plain white sugar is the only kind of sweetener fit for a perfect meringue.But for the topping could certainly be replaced with a lighter vegan Avocado mousse,chocolaty and guilt-free. 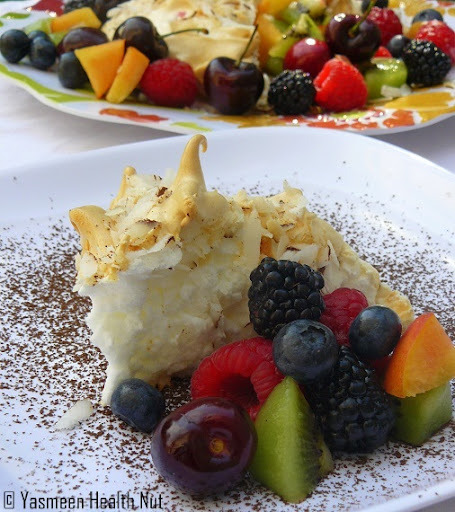 Summer Fruit Pavlova with toasted coconut. My first trial was plain meringue.Kept the height in this one,the slice of this looked much prettier with myriad of summer fruits.How ever both plain and chocolate were equally sweet and enjoyable. Believe it or not,I used a hand held whisk,that amplified the effort of making the meringue,takes about 10-12 minutes of effortful non-stop beating, compare that to 5-6 minutes in a machine whisk.My ever so curious toddler was excited at sight of cracking the eggs,thinking mom's making a special omelet,soon started wondering about the endless whipping.The glossy texture seemed like a delectable cream,but the baked result with an even exciting marshmallow-like treat. Recipe :Low Fat Chocolate Pavlova with Avocado Chocolate Mousse. 1 cup Vegan Avocado Chocolate Mousse(Click the link to see the recipe already posted). Sliced peaches and fresh mint for garnish. In an impeccably clean bowl,add the egg whites and using an electric mixer, with the whisk attachment or a hand held whisk, beat the egg whites on medium-high speed until they hold soft peaks.Add the cream of tartar and sugar, a tablespoon at a time, and continue to beat until the meringue is glossy and holds very stiff peaks. Using a spatula transfer the meringue on a baking sheet lined with parchment paper,you could either spread it with slightly hallow center or keep it high.Alternatively one can use a pastry bag and pipe the meringue into whatever shapes you desire. Bake for about 2 hours or until the meringue is dry and crisp. Cool and store in an airtight container for up to 3 days. 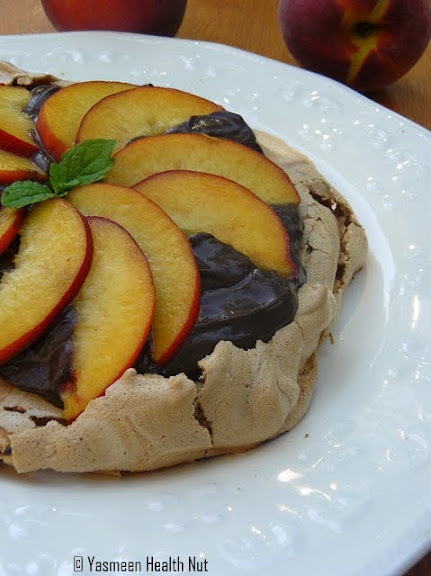 To serve the chocolate pavlova,spread the avocado chocolate mousse,top with the sliced peaches,mint and slice. For the plain Pavlova ,do not add the cocoa and the coffee powder.While spreading on the baking sheet,keep the meringue high.Rest of the recipe remains same.When done,garnish with toasted coconut.Sprinkle the cocoa powder on the serving plate,slice the meringue with a sharp knife, and serve with fresh fruits alongside. 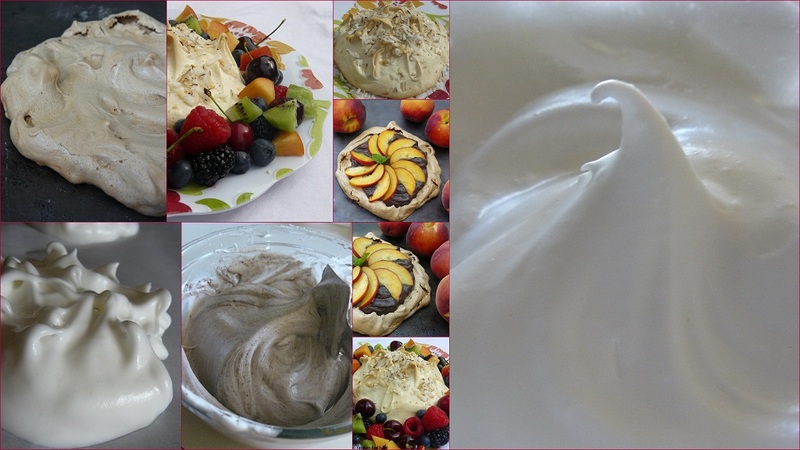 Fall in love with more Pavlovas at Daring baker's blog roll. You did a wonderful job! Both look delicious! Love your low-fat version all that fruit is impressive great work on this challenge. Cheers from Audax in Sydney Australia. Looks delicious! I love the one with fruits. Just wow! Look at that peak! Fabulous Pavlova. 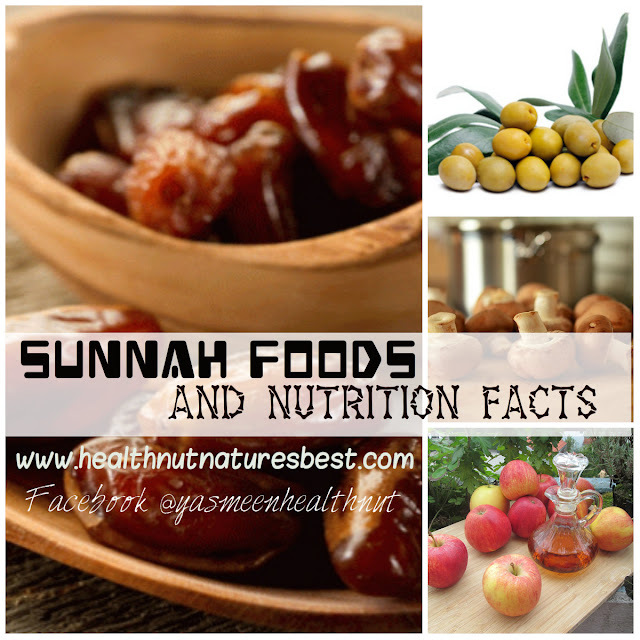 Love the mixture of fruits and definitely the avocado chocolate mousse! Looking good! Mouthwatering pics....such a yummy recipe!!!! thats an incredibly good job that too low fat .mouth watering clicks. Gorgeous!! Love it! I so love your idea of making this healthier. I really think your avocado mousse idea is very clever. 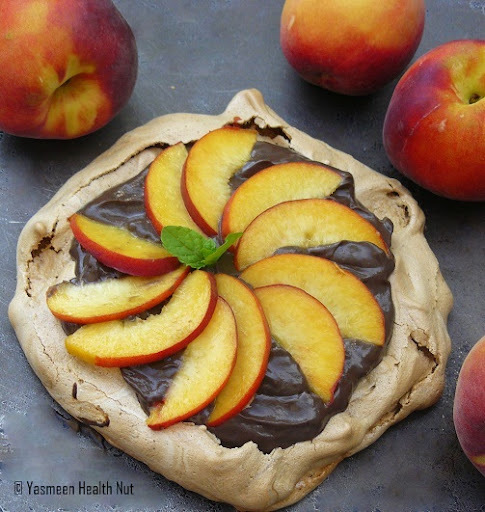 Chocolate pavlova with avacado chocolate mousse and summer fruit topping looks really beautiful and delicious yasmeen. OMG,I don't think I could ever whip up a meringue with hand held whisk.A very well executed challenge...love the look of the avocado mousse over the crisp meringue and all the fresh fruit. Fantastic job. It looks so scrumptious and delicious! Pavlova with summer fruits and avocado mousse looks very delicious. 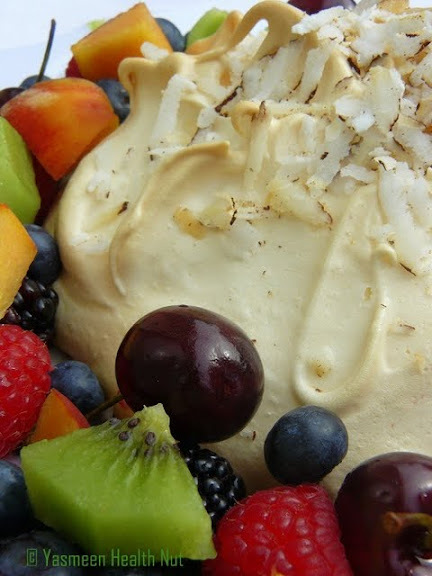 Love this healthier version of pavlova. Great job Yasmeen. Love how you have done the fruits in the first pic. Beautiful and yumm. Yasmeen, wow, I don't have words to say how beautiful and wonderful it looks. Amazing work !!! My goodness that coconut version looks so delicious and fluffy. What an interesting idea with the avocado mousse, I know I have used avocado as a base for pesto before - it's such a versatile fruit. Thanks for sharing. Looks devine and healthy.Love the awesme presentation. That looks superb!! I like how you point out which parts are low fat or low sugar and whatnot! :) Thanks! Cheers! Fabulous yasmeen thats really wonderful with the Avocado mousse I always love the Avocado with chocolate and this with the pav omg delicious.. Next time I must try this. Today, I've enjoyed seeing a few desserts from this special daring challenge. 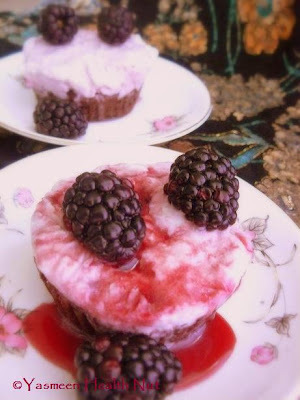 Yasmeen...I love the casual Victorian look that your fruit embellished Pavlova has taken on. Vegan chocolate avocado mousse sounds wonderful! Yum! Both versions look delicious! Nice job on the challenge! Love all the fresh fruit!! Fruit is most definitely the way to go with a pavlova, I agree. Really brings out the lightness of the dessert. brilliant take on the challenge! just perfect! Great looking chocolate pavlova, lovely clicks! 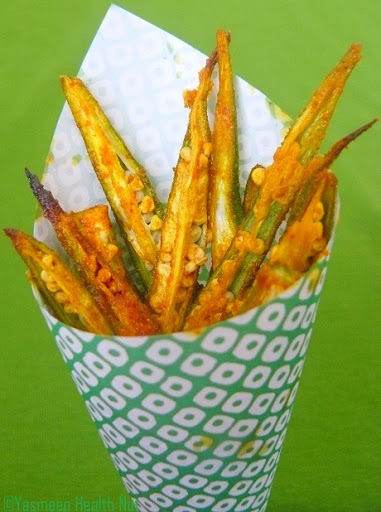 Brilliant recipe, great presentation. You have done a wonderful job! Beautiful! I've never made a chocolate pavlova and the avocado chocolate mousse sounds unusual and delicious. Thanks for the meringue tips, Yasmeen, plus this beautiful, light recipe. Lovely presentation with all fruits on top. Wow very yummy, A very healthy cake. With all those fruits it makes the cake healthier. That is a very awesome job. That's a gorgeous pav Yasmeen. Love the CS too. The texture is amazing. Love the pairing. YUM! 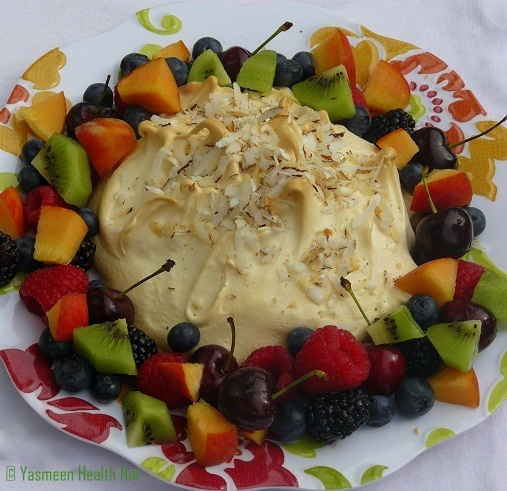 I love the avocado mousse and your photos are so vibrant with color from all those gorgeous fruits! You really created a phenomenal pavlova! This is delicious and IncrEdible. This is amazing.I like both equally.Awesome challenge.